Weddings are a celebration of love and romance, and what symbolizes this more than a kiss? Weddings are the perfect event for Read My Kiss - Kiss Print Readings as guests line up to experience and enjoy this most unique form of interactive and personal entertainment. Everybody wants to find out what their kiss reveals about themselves, including tweens, teens, members of the bridal party, parents and grandparents of the Bride & Groom, family, friends and yes, even the Bride & Groom themselves will enjoy learning about the magic and meanings of their kiss. Are you romantic, passionate, expressive, a good listener, or a flirt, a cheap date, or stubborn? It is all revealed in your kiss. Kiss Prints are as unique as our fingerprints, so no two readings are the same. You will be amazed at what your Kiss Print reveals and the accuracy of our readings. Read My Kiss - Kiss Print Readings are also fantastic fun for the guys, as yes, even the guys will enjoy putting on lipstick, providing their kissing samples and learning about their passionate puckers. Read My Kiss - Kiss Print Readings not only offer fun and hilarious entertainment, but also create fantastic photo opportunities throughout our performance to be remembered for years to come. Our "Kissologists" will provide everything needed to create a fun, interactive atmosphere that will be one of the highlights of your special day. Read My Kiss - Kiss Print Readings will not interfere with other ceremonies, festivities and entertainment, which makes our appearance a welcome addition to wedding receptions of all sizes. Let your guests enjoy our most unique style of wedding entertainment and create lasting memories. Each participant will receive a personal reading and a special Keepake Kiss Print Card highlighting their personal reading. As a special gift for the Bride & Groom, we will include a special framed Kiss Print Compatibility Analysis created from both of their kisses! 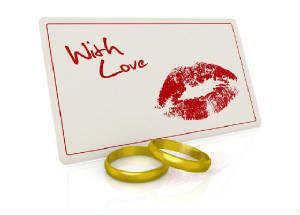 Also available is our popular Kissing Board, allowing guests and family and friends to provide a kiss for luck to the Bride & Groom, complete with their Kiss Print and signature to create a great keepsake of your guests and reception. Read My Kiss - Kiss Print Readings are excellent for cocktail hour entertainment, after-dinner entertainment or as entertainment throughout the entire reception as the celebration and festivities continue into the night. Read My Kiss - Kiss Print Readings also includes a 10-15 minute showcase performance to announce and introduce our appearance and is an excellent icebreaker. From a simple hour or two feature, to our full-reception package, let Read My Kiss - Kiss Print Readings be the hit of your wedding reception! Read My Kiss - Kiss Print Readings are also ideal entertainment for Bachelorette Parties, Bridal Showers and Rehearsal Dinners!